I remember being quite excited when ZeroDegrees opened in Reading, around five years ago. My father-in-law raved about the Bristol branch, and he knows good food when he sees it. And yet when I went there, shortly after it opened, I remember a few disappointing visits. It ought to be good. As a family run mini chain of “brewpubs” with an emphasis on good food and innovation (according to their website) it should fit right in to the Reading restaurant scene in the same way that Bill’s (for good or bad) has been welcomed with open arms. Despite this I decided to give it another try for the blog. Maybe I’d been too harsh on the place in the past. And after all, if I ruled out everywhere that had given me a dodgy salad once upon a time there wouldn’t be many places left to review. The menu at ZeroDegrees is a strange beast: it’s almost exclusively pizza, pasta and mussels. So far so good, you might say, but it’s almost as if they found these limitations frightening and decided to offer as many different pizzas as possible. I counted almost twenty on the menu, seemingly carrying out a world tour through the medium of pizza. So there’s a thai green chicken pizza (topped with glass noodles), a crispy duck pizza (topped with crispy tortillas, naturally), “Mexican sausage”, whatever that is, and teriyaki chicken. The mussels had slightly less of an identity crisis, although even then a Thai green curry option was available. 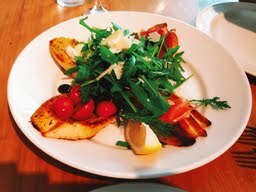 The crostini starter (to share) was nice enough: sort of a garlic bread version of a four seasons pizza. The four slices of bread were thickly sliced, crispy on the edges and generously topped with “bruschetta” (which turned out to be cherry tomatoes, black olives and garlic), parma ham (which was generous to a fault), smoked salmon with mascarpone, and a very small strip of goat’s cheese. This came with a big pile of rocket and some parmesan which was slightly tough, as if it had been sliced then left out to dry. The rocket was a sad thing which seemed to be there for no other reason but to fill space: undressed and a little dishevelled, a few brown bits, a few tough leaves. I like rocket as much as the next person, but the next person would have left this rocket, and so did I.
I tried to get the waiter’s attention to ask for some dressing, but he was busy elsewhere. In fact, despite there only being about three or four tables occupied on a Bank Holiday lunchtime, service was best described as omni-absent: always lurking behind a pillar or in the kitchen when you wanted someone. When he came to take the plate away I noted that he didn’t ask how it was. I never know whether this is a lack of training or a conscious decision not to ask a question you might not like the answer to. Still, this was only a £7 starter and it went between two well. 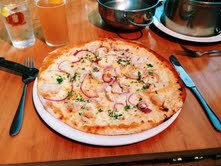 My guest’s main was the roasted garlic chicken pizza (“garlic chicken, red onions, parsley, white wine garlic sauce”). The dough was not unpleasant, if a little on the thick side, and the chicken was tasty although it wasn’t at all what either of us was expecting: roasted garlic chicken somehow suggests chicken that has been torn in some way, whereas these were pale chunky blocks of chicken that looked like they had been fried in a pan. The flavour of the sauce was nice, if incongruous – you don’t realise how integral tomato sauce is to a pizza until you order a pizza without it. He didn’t finish it, which is something of an accolade for ZeroDegrees as I’ve never seen him leave pizza before. 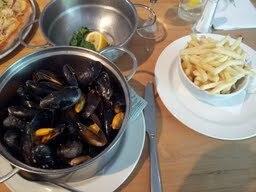 To contrast I had the moules mariniéres, one of their signature dishes; a kilo pot served with fries, mayonnaise and ketchup. This is one of my favourite things, when it’s done right. I like a big bowl of mussels, plump and juicy and then the delicious soup at the bottom filled with shallots and cream and herbs that you can’t help but keep eating even though you know it’s a big bowl of cholesterol, salty and fatty. I love the bit towards the end, when all the shells have been discarded and there’s just you, the sauce, a spoon, some bread to dip and some skinny frites to pour in, even though you know you should probably stop. Just typing that paragraph makes me realise how far from that ideal the ZeroDegrees mussels fell. They were fine. Fine. Nothing more. I dug around with my spoon and could find nothing, no shallots, no herbs, just a salty, creamy liquor with no real depth to it. If I contrast this with the moules served at Côte, another chain, on the riverside (which they only serve when in season) they came out sadly lacking. I managed to flag down my waiter and asked about the absence of onions and herbs and was told that the garlic and onions are ground into a paste and cooked with the mussels. This might have been true, but if it was there was little evidence in how it all tasted. I ate half, in the end, and a fair few frites, but I left the rest. I just didn’t see the point – as a dish it was like a novel where someone had torn out the final chapter. Even the mayonnaise and ketchup came in those little paper cups I associate with much cheaper restaurants. I grabbed my cleansing towelette (no finger bowl here), cleaned up and asked for the bill. I couldn’t even muster the enthusiasm for a dessert, especially considering that just one item says “home made” on it, suggesting the rest are shipped in frozen from Brake Brothers or suchlike. When the waiter took away half a bowl of mussels and half a portion of frites, his curiosity once again deserted him. So, I think I’m pretty much in the same place with ZeroDegrees as I was just after it opened. It should be marvellous, but it isn’t. Reading could do with an independent place that serves pizza and moules, but Zero Degrees isn’t it: the ethos behind the chain is great but it just doesn’t carry through to the food. The waiter seemed a little out of his depth (he was so young and innocent that I wanted to look after him rather than be served by him, which is all very sweet but really not how it should be) and in a big open restaurant with only four occupied tables, good service should be easier than this. I think the best I can say is that ZeroDegrees is OK. The food (one shared starter, two mains, one drink each) came to £45, including the “optional” 10% service charge they add on. I’m not sure I’d have tipped otherwise, and I doubt I’ll pay it another visit. There are some restaurants in Reading where the front of house staff have that very special knack of making every customer feel like a VIP. It starts with the greeting – effusive enough to make you feel like they’ve really missed you since your last visit, not too over the top to stop it seeming sincere. They might remember your name, or ask you about that holiday you mentioned last time. You just know that they can talk with authority about every on the menu, where the ingredients are from and, if you’re very lucky, they’ll even remember things you don’t like (coriander, perhaps) and make sure they don’t end up in any of your dishes. Restaurants like this are the diamonds of the food scene; they make you want to go back again and again because you want to support them. They feel like a family that just happens to cook you excellent food. I can think of three places like this in Reading off the top of my head, and it’s no coincidence that the first ever Edible Reading review is at one of these restaurants. I wanted to make sure we started with the right place – somewhere that lots of people but not everyone will know (so you can judge my writing and opinion), somewhere that doesn’t shout about its credentials, somewhere that can be overlooked by the mass of visiting shoppers and so tends to be a full of locals. Someone on Twitter said “I’d like a recommendation that makes a change from going to Carluccio’s” and I thought, Oh, you should go to Pepe Sale. The location’s a bit of a problem. Pepe Sale is in an unassuming part of Reading, tucked behind the distinctly retro (not in a good way) Broad Street Mall, snuggled up next to the grotesquely brutal Hexagon Theatre in a wide pedestrian thoroughfare that the council (also in an adjacent concrete monstrosity) won’t let them put tables out onto. If you didn’t know it was there you’d never happen upon it. The décor is pretty basic, too: pink and grey granite tables with white china and peach cloth napkins are laid out at every table, most bearing a small potted aspidistra and a square dish waiting to be filled with olive oil. The look’s dated but homely, lots of bright, bold pictures on the wall, hanging plants around the room. But when it comes to restaurants, looks aren’t everything. As Marco, the endlessly charming front of house, told me that evening, Italians are much more interested in the food than the room. Fortunately, Marco came to my rescue. I explained my dilemma and he said the kitchen could rustle me up a plate of grilled vegetables but served with goat’s cheese. How could I resist the opportunity to eat off menu? Exactly. We asked for Marco’s help in choosing wine and again, he came up trumps, suggesting one of the cheapest wines on the menu (no mean feat – apparently the wine list has a total of sixty-six wines, all Italian). It’s a wine I hadn’t heard of – Santesu IGT Isola Dei Nuraghi, a blend of vermentino and nuragus (both varieties of grape are typical for Sardinia, where the team at Pepe Sale hail from). I loved it – a fresh, crisp white, dry but not too dry with hints of honey to make it taste of early summer (which is often all the summer you get, in Reading) At just over fifteen pounds a bottle it was hard to drink just the one, although we did. School night and all that. The wine was impressive, but the recommendation was more impressive still – lovely to see a restaurant that doesn’t automatically suggest their most expensive wine (or when you say “I want to spend around £30” immediately recommend a bottle that is £37. Cheeky). My off menu starter was fabulous. The vegetables were thin verging on translucent, lightly griddled with a generous helping of garlic and a lovely caramelised taste offset beautifully by the salty disc on top: simple food, done well, no whistles and bells. 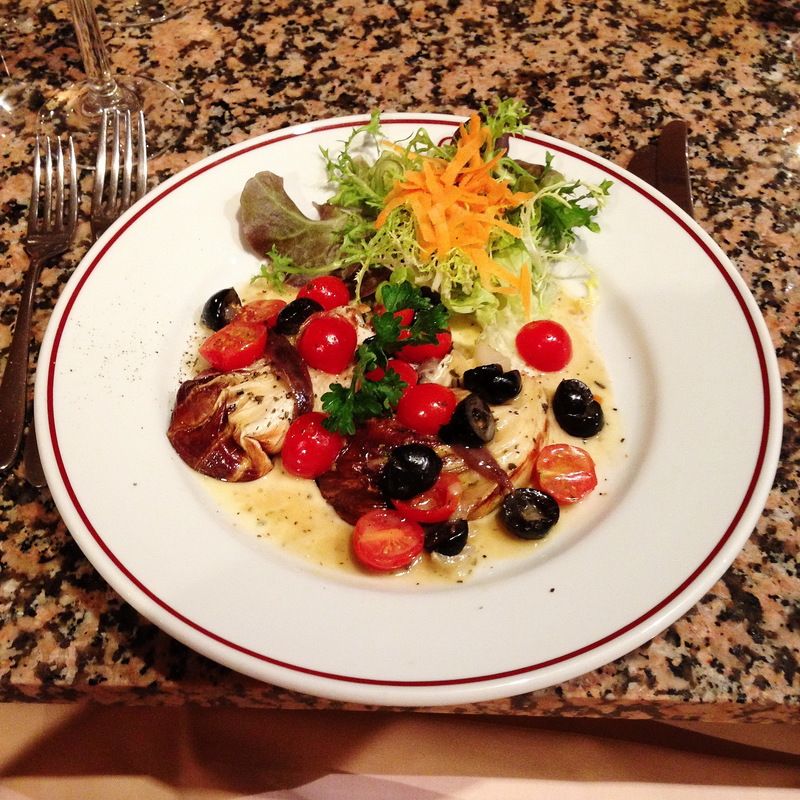 My companion had mozzarella baked in radicchio with anchovies, black olives and cherry tomatoes. Again, the combination was perfect – sweet tomatoes, chewy mozzarella (the polymer of cheeses) and bitter radicchio leaves. Beautiful to look at, tasty and unpretentious. My main wasn’t a disappointment, although I never expected it to be. The bowl that came out was just right – not too many ravioli (I don’t like a pasta dish that feels like a challenge), all perfectly cooked, just al dente, with fluffy crab inside, in a creamy tomato sauce. My only criticism is that the ravioli was supposed to be with beetroot but the flavour and colour was just of plain pasta. It still tasted wonderful but it was not quite as I expected. Marco did show me the pale pink, raw ravioli when I asked about the absence of beetroot so it was definitely there, just undetectable. It didn’t change how delicious they were, and if I hadn’t been thinking about writing this I mightn’t even have noticed. 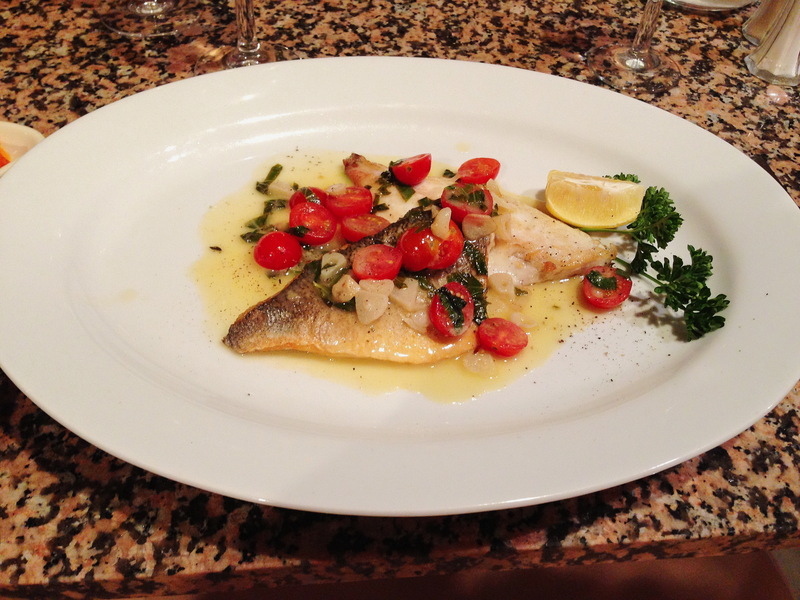 The other main at my table was also on the specials menu – sea bream cooked with white wine, cherry tomatoes, garlic (lots of it which is great if, like me, you’re a fan) and basil. The two fillets of bream were cooked perfectly, with creamy white flesh and crispy skin: just like my starter, simple ingredients treated with respect. The side order of vegetables included potatoes to die for – salty, herby, well worth distracting your companion’s attention to steal, which to my shame is exactly what I did. Of course, many people would go home after two courses but I knew that, in order to write a full review, I would have to grit my teeth and order dessert. It’s a hard life. So, out of duty, I opted for the basil panna cotta with a balsamic reduction and my companion had the sweet ravioli. The panna cotta is intriguing. Basil’s not a herb often found in sweet food so it feels brave of them to put it on their menu in what is a traditional restaurant. The basil flavour is very gentle. It’s a light aftertaste which, coupled with the balsamic, almost plays tricks on the tastebuds because of what I expect basil to taste like. It was weird and yet exactly right. It goes really well with the creamy sweet pannacotta and the sweet but vinegary balsamic cuts through the flavour nicely to keep it fresh. Lovely and very witty (if I can say that without sounding too much of an idiot). Similarly, it was a novelty to have sweet ravioli. 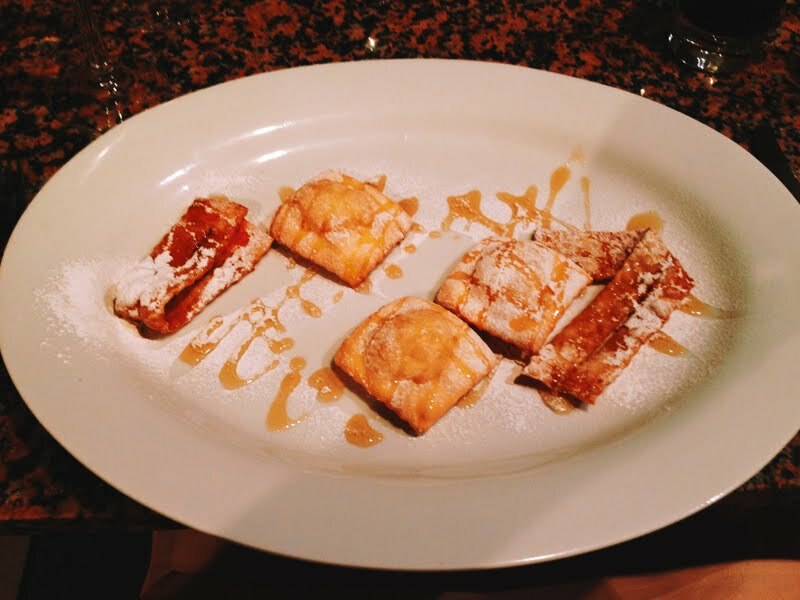 It’s fried squares of pasta filled with ricotta and orange zest, drizzled with honey and dusted with icing sugar. The pasta becomes like pastry when fried – crisp and sweet – and the centre is incredibly moreish (I could have eaten his dessert as well as mine, if he’d only let me). The food is so good that you almost don’t notice just how good the service is. Throughout the meal Marco was topping up our glasses and chatting to us and the other customers in the restaurant, in that way which looks effortless but is probably bloody hard work. Even when we were the last table in the restaurant I didn’t feel like they were in a hurry for me to leave, that family feeling again. The food and the service are so good that you almost don’t notice what good value it is, either: three courses for two with a bottle of wine and an after dinner liqueur each (Pepe Sale does a range of wonderful Italian digestifs, many of which have the bitter taste of dandelion and burdock with attitude – I love it, though it’s not to everyone’s taste) came to eighty pounds. It’s not cheap – granted, Carluccio’s is a lot cheaper – but it’s worth every penny. So, that’s the first review here at Edible Reading. If you’ve been, you probably know how good it is already. If you haven’t, you ought to check it out. And if, hypothetically speaking, you had just arrived in Reading and were trying to choose a venue for your first ever meal – as I am, I guess, in a virtual sense – you could do an awful lot worse. Reading is a place where it’s easy to get a meal, but not always easy to get a good one. It’s not that we don’t have restaurants; we have loads. Just head to the Oracle, stand on the arching bridge that connects the shops to the cinema and look – every chain you care to name, on either side of the canal. But that’s the problem, really. We have, it can’t be denied, a lot of chains – from the well-established to the just starting up. We are in the forefront of expansion for chains, too: the first Bill’s outside Brighton was here, the first Five Guys outside London is opening in the Oracle soon. In some cases we have more chains than anybody could ever need; right now Reading has two branches of Bella Italia (is this really necessary? you might wonder), two branches of Pizza Express. And that’s before we get on to the cafes and fast food joints – two McDonalds, three Burger Kings (there used to be four), four Caffe Neros (there used to be three, before they took over one of the four branches of Burger King), four branches of Costa Coffee (two of them in the Oracle, one a stone’s throw from the Oracle) and four branches of Starbucks. One reason why people go to the chain restaurants so much is that they’re a known quantity. A Pollo Ad Astra at Pizza Express on the Riverside is going to be much the same as a Pollo Ad Astra on St Mary’s Butts or in Bristol, Bath, Banbury or Birmingham. This is especially true in Reading, because if you’re looking for help or guidance in terms of where to eat, well, there isn’t much. You can consult the local paper, of course. But the reviews in there are all comped and the editorial policy appears to be not to publish a critical review. What that means in practice is that the same places come up again and again – a high-end freebie here, another trip to a suburban curry house there – and the bland write-ups mean you come away with no idea whether, if you were spending your own money, you would be wasting it. This doesn’t deter them from their other editorial policy: make sure the cost of every item is clearly listed. I had the burger (what is it about burgers which so fascinates the local paper?) which at £9.95 was juicy and good value. My partner had the mushroom risotto (£8.95), which he thought was slightly underseasoned. It can feel a bit like reading a shopping list, half the time, instead of a review. So, you can’t trust the local paper, because it likes all the places it reviews, can tell you the price of everything and the value of nothing. Where else can you go, then? TripAdvisor? TripAdvisor is a curious one, and there’s a big debate in general about how trustworthy it is for restaurants: many bloggers, and restaurant reviewers for that matter, are not fans. Partly this is motivated by distrust about the democratic nature of TripAdvisor – it is the ultimate expression of Web 2.0 in some ways, just like Goodreads and Amazon reviews – and an elitist view that people as a whole don’t know best. That said, there’s some validity to the criticism. Sometimes, a restaurant’s success on TripAdvisor isn’t always about the food, or the service, but about how good they are at mobilising support on TripAdvisor (on a recent meal out, we thanked the waiter and he specifically asked us to leave a good review on TripAdvisor if we enjoyed it). Is TripAdvisor a good guide for restaurants in Reading? Well, yes and no. A quick look at the site illustrates the problem neatly. At the time of writing, the top three restaurants in Reading are (and have been for a while) Whittington’s Tea Barge, Café Yolk and Tutti Frutti. All of them are establishments with something going for them but are they restaurants? Some of the restaurants in the top ten – Mya Lacarte, Kyklos, the Bladebone – are very good places, but it’s hard to escape the fact that TripAdvisor feels very hit and miss. So the local paper can’t help you and TripAdvisor is a bit of a lottery, but never mind, because there are always blogs, right? Well, no again. Reading has never had a restaurant blog that I know of – well, not until now, because that’s what I’m here for. Welcome to Edible Reading. Reading’s isn’t a stagnant restaurant scene by any means. We don’t have the regular turnover of restaurants you’d get in a bigger city, but there is still enough change that there’s something to write about. Kyklos, the new Greek restaurant in King’s Walk, opened earlier this year. So did The Lobster Room on Valpy Street. House Of Flavours, in the old Mangal spot on Kings Road, has been open for a month or so. Five Guys – which may or may not turn out to be terrible, depending on who you read – opens later this year. None of the new places, so far, have been reviewed anywhere. So I reckon there’s a gap in the market for a restaurant blog. I don’t claim to be an expert – and I’m not sure I’d trust anybody who told you they were – but I eat out fairly often, I love food and, crucially, when I have a bad meal it’s my own money I’m wasting. What you can expect here is weekly, unbiased reviews of all kinds of restaurants in Reading (and possibly the surrounding area) and – if past experience is anything to go on – some very shoddy photographs of food. All comments and debate are encouraged, here or on the Twitter feed (@EdibleReading, of course) and if you have any suggestions for places you recommend, or have always wanted to go to but aren’t sure about, do leave a comment, Tweet at me or send me an email (EdibleReading@gmail.com). Should be fun, shouldn’t it?